Malaysia – an endemic surveillance country! Privacy International (PI) is a human rights group formed in 1990 as a watchdog on surveillance and privacy invasions by governments and corporations. Recently, it issued the 2006 results of the ranking assessment of the state of privacy in the world. The aim of this survey was to find countries with nurtured privacy protection and respect for privacy. The survey does not want to humiliate the worst ranking countries but to show that good privacy environment is possible. The best ranking countries are Germany and Canada with the healthiest privacy environment. The worst ranking countries of the survey are Malaysia and China. In EU, it is the United Kingdom. The bottom line is that the Hindu temples of Malaysia are and have always been part of the Malaysian cultural landscape. Hinduism is one of the Malaysian faiths. It has been rooted in the culture of Southeast Asia for more than 2,000 years. If anything, its long historical embeddedness shows that it deserves more than a token mention in the history books. Religion’s entry into politics often leads to its politicisation and loss of its core spiritual values. This is painfully obvious to the scholars who have watched the rise of political variants of Islam, Christianity, Judaism, Hinduism and Buddhism the world over. This has led many an analyst to the somewhat depressing conclusion that despite its lofty ideals religion has yet to develop immunity to the temptation of power. Since every religion is understood and judged by the actions and behaviour of its adherents, it is clear that Muslims, Christians, Jews, Hindus and Buddhists are often themselves the reason why these religions get such bad press these days. I refer to the letter Dr M has no right to moral high ground and feel that the writer has hit the nail right on the head on the issue raised. I want to add here that it is not only Dr M who practised such selective international policies and worldview, but that the present Abdullah administration is also guilty of the same thing. We will see the government of a supposedly mult racial country rushing to send aid and assistance to Muslim nations stricken by natural disasters but when similar catastrophes occur elsewhere in a non-Muslim nation, we will hear nothing from the government. We always hear propaganda saying that our country gives assistance without looking at race, colour or religious leanings but the truth of the matter is that they will only help Muslim countries. 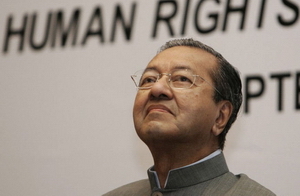 Dr. M – a bigot? I refer to Dr Mahathir Mohamad’s nomination for the Nobel Peace Prize. All I can say is that under Dr M’s tenure as prime minister of Malaysia, the country’s policy concerning human rights and crimes against humanity was very simple and obvious. Catholics and Protestants can kill each other. Sri Lankan’s Sinhalese and Tamils can kill each other. Government-sponsored genocide with Hutus killing Tutsis would elicit no condemnation from the Malaysian government.These are merely non-Muslims killing non-Muslims. Muslims can also kill Muslims. Like what is happening in Darfur. Will the Sudanese leaders be regarded as war criminals by Dr M? Oh no, that is not genocide. Because that does not fit the equation. The simple equation is that non-Muslims cannot kill Muslims. Any other equation is, if not acceptable, at least not a war crime.